ARE YOU BRAVE ENOUGH TO TAKE THE DOORS OFF YOUR CLOSET?? OR HANG AN OLD RAKE OUT FOR DISPLAY?? 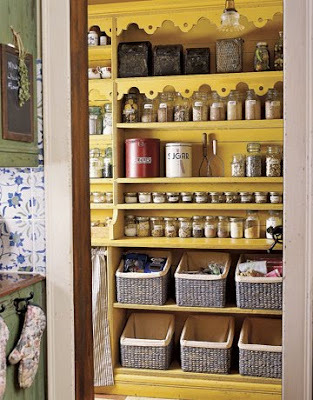 IS YOUR PANTRY THIS ORGANIZED?? OR THIS PRETTY FOR THAT MATTER?? ARE YOU HANDY ENOUGH TO MAKE AN ORGANIZATION CART?? 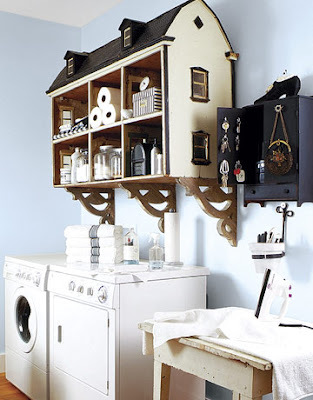 ...OR A DOLL HOUSE CABINET?? IS YOUR CREATIVE SPACE THIS ORGANIZED?? 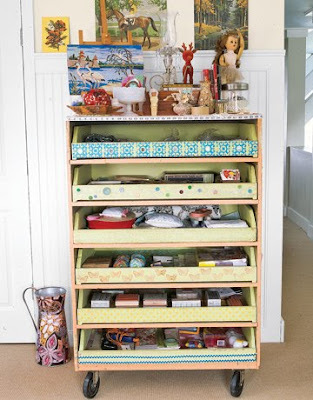 DO YOU HAVE OLD FRENCH MAIL BINS AND A GREAT OLD CART TO HOUSE YOUR CLUTTER?? GET THOSE CREATIVE JUICES GOING. 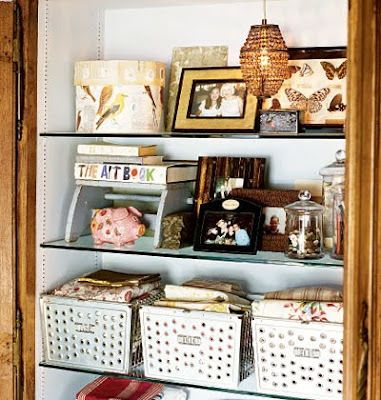 IT'S TIME TO START ORGANIZING YOUR HOME IN A CLEVER OR FASHIONABLE WAY YOU'VE NEVER THOUGHT OF. GOOD LUCK, I'VE GOT MY OWN CLOSETS TO WRESTLE, YOU'RE NOT ALONE!!! Are YOU kidding me? I WISH for all of the above!!!! I love the rake idea. I have to put that on my garage sale "look for" list!!!! 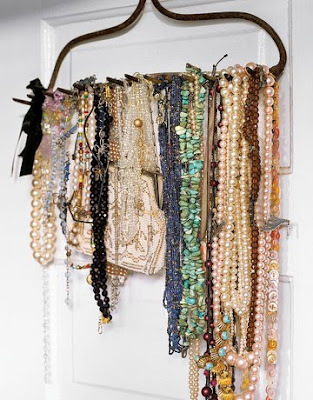 I'd probably need about 10 of them with all of the handmade jewelry and ribbons that I have!!! Great idea Gail...you are so inspiring!!! these are all fabulous ideas... I have the dollhouse in my inspiration folder...I just wished I had a pantry....bummer. Thanks for inspiring me to clean out and spiff up! I only WISH my place was this organized!!! Mahalo for dropping by, and never give up on Oprah! who knows? the organize junk fairy will come in, swoop down & take serious pity on me! Thanks for such a great post. 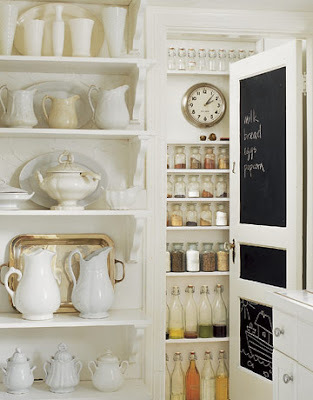 I toatlly want to get my pantry spruced up this January! I just need to get my hands on some of those cute slant baskets! I loook for the, all the time online & I have never seen any as cute as those! Maybe I should look for some of that gingham wall paper for in there ~ actually that might be impossible to do since tere are shelves everywhere already. But tempting! THanks so much for all your sweet comments on my blog about the losses in my lie lately ~ I can't believe how much support & comfort I have received from friends I have never even met! I actually LOVE your daughters jewelery! I relally should try to find a good picture & order one from her. What a treasure! Your daughter seems like a pretty wonderful caring girl! I bet the two of you have a ton of fun together...they grow up quick don't they!? Well I told myself I was gonna MAKE time to read tonight since my book is neglected lately but here it is 10:30 already ! So I better get going! Good night Gail! hola, esa casita en el lavadero es original, pero que desperdicio de casita. Felidades por tu blog. Está muy completo.